Baby Lock Solaris - the leader in cutting edge technology. Put your projects in an entirely new light with the Baby Lock Solaris. With the revolutionary new IQ Visionary™ Technology, you’ll see how your design looks before you stitch it out! 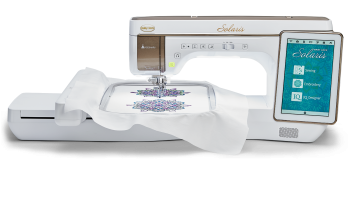 Solaris’ built-in projector displays your stitches and embroidery patterns on the fabric in vibrant full color for perfect placement every time. • NeedleCam™ Digital Camera for embroidery and sewing positioning with faster scanning.